The Game Guide for StarCraft II has just received a massive update, giving detailed explanations on the campaign features that were showcased during the January 17th press event! 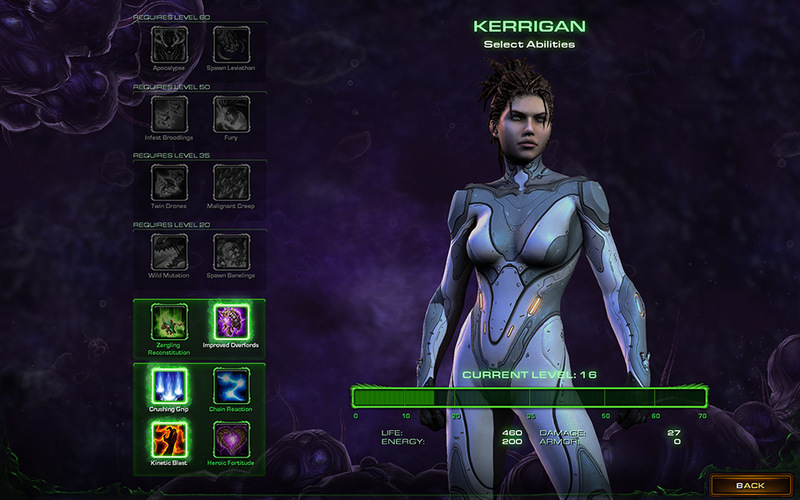 Among the new pages is the Kerrigan page, which has explanations of the campaign's RPG elements, levelling up Kerrigan, and videos for each of the passive skills you can obtain. The other page that was added is the Evolution Pit page, which has information on how mutations and evolutions work (they're two different things), the exact stats of a few mutations, and short descriptions of the Zergling, Baneling, and Roach evolution options. Be sure to check out the full pages for tons of info. There's no spoilers, so don't worry, oogle your heart away while waiting for the Heart of the Swarm release on March 12th! Blizzard has been kind enough to gather all the information from the AMA they held recently and post it on the StarCraft II front page. The AMA has brought out a lot of good answers from Dustin Browder, game director of StarCraft II, Alan Dabiri, lead software engineer, and David Kim, game balance designer. EnderSword: Do you have plans to hold more tournaments like the WCS this year? DB: We have not yet finalized our plans for 2013 or beyond. I know our esports team are working really hard on it now and we are talking frequently with esports teams as well as esports organizers. We do want to do what we can to support the community, but I don't have a really good answer to your question. As soon as we have something solid we will announce it I'm sure. You can view the full transcript here, and the actual AMA here. 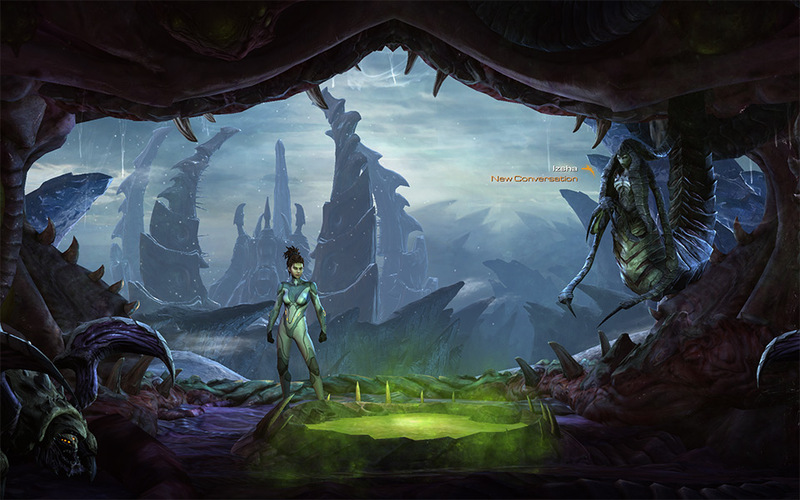 A new situation report is out, discussing Heart of the Swarm balance. Our general thinking on new units and abilities is that using them will always be learned faster than defending against them for obvious reasons. Because we’re already seeing some players defend against the new Medivacs extremely well, we definitely want to wait on this feedback to really make sure that it is in fact overpowered before making a change. You can read the full situation report here. The next StarCraft short story, Frenzy, is out now. You can read it here. Alden pulled up, skimming along at cliff level, breaching in and out of the sunlight like a fleet fish leaping upstream. Behind him were the concerns of school, his parents, the draft… the other draft. All that was back on the ground. Up here, with the wind pushing into his lungs, stretching the glider, and roaring in his ears… Alden was free. The sound, when it came, was so quiet beside the roar of the wind—a faint noise, and distant. Yet it cut to the marrow of Alden's bones as no other had in his twenty years. A Heart of the Swarm trailer titled Vengeance was uploaded today, showing off previously seen cinematic clips and some never-before-seen clips as well. Another StarCraft short story, The Teacher, is out. This story focuses on the Hydralisk, and a Dominion project that experiments on controlling Zerg. You can read the story and download it for free here. New Copy Link buttons have been added, which automatically copy certain links the clipboard, allowing players to share them with others via clickable links in chat or on the web. When clicked, these links will navigate to the in-game page. No Fly Zones now have three color states: Normal (no overlap), Overlap (hard radii overlap), and **Warning (only soft radii overlap). For best pathing performance, avoid the Warning state. Libraries defined in the active document are now shown in the Triggers list rather than the **Libraries list. The Libraries list will only contain read-only dependency libraries. The next installment of the new StarCraft short story series is out. This one is about the horrors of a Zergling attack. Read it here. No one had thought the zerg would ever really attack Lawndale. The strategic value in the grand scheme of the war was minute. So when the alarm ripped through the silence and Virgil Caine, Rho Squadron's sergeant, began barking orders, his marines all scrambled to their feet and prepared for the worst. But it wasn't the worst. It was suicide for the zerglings. There was no real point. The beasts were outnumbered and outclassed. Still the stupid, seemingly mindless xenos came anyway. Yes, the beta test for Heart of the Swarm is nearing a close, finally ending on March 1st, 2013. But not to fret, Heart of the Swarm will be released on March 12, 2013, so it's not too much time away from the game.